Geoff Eigenmann returns to GMA-7. He will be the leading man of Glaiza de Castro, who will top-bill the upcoming teleserye Contessa. They will be joined by Geoff's cousin Gabby Eigenmann and Kapuso actress Lauren Young. 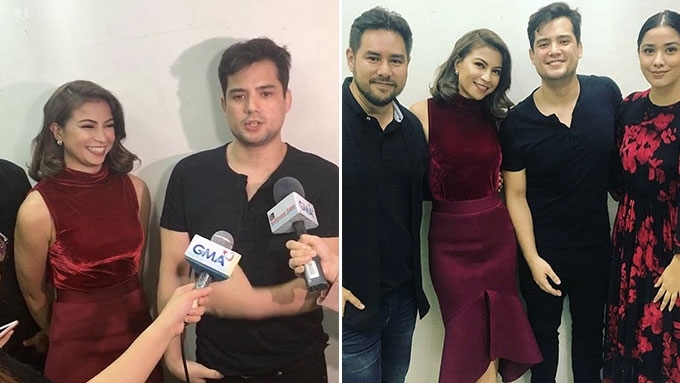 Geoff Eigenmann returns to GMA-7 two years after he left the Kapuso network. He is set to join a new drama series titled Contessa, with Glaiza de Castro in the titular role. A story conference for this new drama series was held last night, December 5. This is Geoff's first teleserye with GMA after he transferred to ABS-CBN in 2016. In the Kapamilya network, he became a part of the daytime series Be My Lady. Geoff and Glaiza first worked together as a pair in the 2010 series Grazilda, where Glaiza also assumed the title role. In this project, Glaiza will also be paired with Jak Roberto. They will form a love triangle with Geoff. Gabby Eigenmann, Geoff's cousin, will also play an important role in Contessa. This is the first time that they will be working together in a drama series. Abangan ang unang pagsasama nina Gabby at Geoff Eigenmann sa isang Kapuso drama series with versatile actress and lead star Glaiza de Castro bilang #Contessa soon on GMA! Other cast members include Jak Roberto, Lauren Young, Phytos Ramirez, Leandro Baldemor, Will Ashley, and Dominic Roco. Freelance actress Bernadette Allyson, who is currently in ABS-CBN's Wansapanataym: Jasmin's Flower Powers, is also a part of the series. Tetchie Agbayani, who has been doing teleseryes for ABS-CBN for the past 10 years, makes her Kapuso comeback via this drama series. Her last GMA-7 appearance was in the superhero series Super Twins aired in 2007, while her last TV project was the Kapamilya daytime series The Greatest Love. At the storycon for the new GMA drama #Contessa stars Glaiza de Castro, Lauren Young, Geoff Eigenmann, Gabby Eigenmann, Phytos Ramirez, Bernadette Allyson, Dominic Roco, Will Ashley, Leandro Baldemor and Ms Tetchie Agbayani. Directed by Albert Langitan. SOON! Contessa serves as the follow-up project of Glaiza after she portrayed the role of Pirena in the requel of Encantadia, and in the sequel of Mulawin vs. Ravena. The 29-year-old actress already did a shoot for the new series, which she posted on her Instagram account. Contessa will be helmed by Impostora director Albert Langitan. Its airing date and timeslot are yet to be announced.